Memorial Day is a great time to enjoy a hotdog, and the approaching summer season provides even more opportunities to relish a quality frankfurter. Having grown up in Washington, NC, where the legendary Bill’s Hot Dogs represents the gold standard, it takes a lot to impress me. Nevertheless, here’s the lowdown on several local places and one day-trip-worthy hotdog joint worth seeking out. 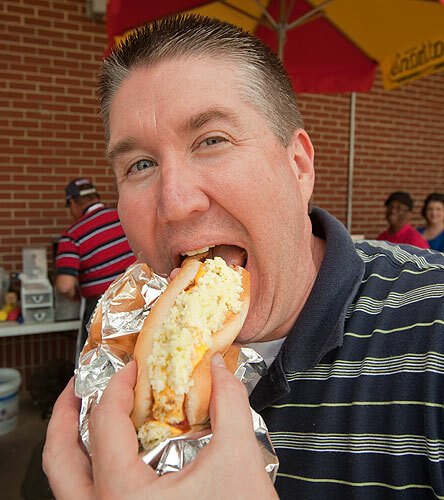 On any given day just outside a popular home improvement store in Cary, Jim Rivers serves Nathan’s brand hotdogs from his stainless-steel portable cart. Rivers owns Jim’s Ole Time Hotdogs, a business he has run since 1998. While you can get the red variety, I highly recommend the all-beef wieners. These are served on fresh, steamed buns with copious free condiments, including two kinds of mustard, ketchup, chili, onions, slaw, relish, cheese, hot sauces, mayonnaise and sauerkraut. Open daily from 11:30 a.m. to 5 p.m., Jim’s Ole Time Hotdogs accepts cash only. Down the road a bit in Raleigh, 70-year-old renowned hotdog emporium The Roast Grill (www.roastgrill.com) offers seating for just 12 patrons and features Swift Premium brand mostly beef wieners that owner George Poniros cooks until charred black. Texas sweet onions, house-made chili and glass-bottled Coke top things off nicely. Just be sure not to request ketchup—it’s strictly forbidden! Whatever you do, save room for homemade pound cake or baklava. The Roast Grill is a cash-only eatery open from 11 a.m. until 4 p.m. Monday through Saturday. Finally, well worth the drive to downtown Winston-Salem is Skippy’s Hot Dogs (http://www.skippyshotdogs.com/), which features Nathan’s all-beef wieners served on incredible homemade pretzel rolls. An absolute must accompaniment: the hand-cut shoestring French fries (a side order is plenty for one person, but baskets are also available). Skippy’s accepts cash or credit and is open Tuesday through Saturday. Hours vary, so check the website for more details like how to find a good parking spot. Also longines replica watches, the new boat with T more stylish touch rolex replica uk version of the collection added touch, durability, view T- touch movement than before. The first is the actual meaning of rolex replica the actual century-old manufacturer, is really a distinctive viewpoint creative designers, each for that globe to operate collectively to create time cartier replica sale is really a big scenery. Lately, Cartier replica collectively worldwide famous curator rolex replica sale the actual Shanghai Art gallery associated with Modern open up "twinkling · Everlasting -- Cartier replica Period Artwork Exhibition", that is the actual exhibit following a rolex replica gallery within Zurich, Europe, Singapore Artwork Technology Art gallery with regard to the very first time getting within The far east, a lot more than one hundred and eighty bits of Cartier replica wrist watches items to exhibit the actual wealthy replica watches sale manufacturer century associated with background, in addition to top watchmaking appeal.